Walkom plays the puck during his homecoming series against RMU - ©Todhunter, Jared D.
Brendan Walkom has grown up with a unique perspective of the game of hockey. He grew up in Pittsburgh, experiencing the boom of the Penguins and playing for teams like the Hornets and Pens Elite. His view of the game has also been influenced by his dad, Stephen, an NHL referee for nearly 30 years and the current NHL Director of Officiating. This upbringing has helped him find success as a player, leading him to play Division 1 hockey as a freshman at Bentley. Walkom, a native of Moon Township, Pa. can trace his earliest hockey memories back to an arena that no longer exists. Walkom played hockey at that rink through Double A, and then moved on to teams that many of the successful local products have played for, the Hornets and Pens Elite. Former teammates from these programs are currently playing on, or are committed to Division 1 programs including Beck (Robert Morris), Connor Ford (Bowling Green), Eric Cooley (Niagara), Chad Veltri (Niagara Commit) and Paul Maust (Mercyhurst Commit). After a year with the Hornets, he transitioned to the Pens Elite where he really began to make a name for himself. He served as the captain of a loaded U-16 team during the 2014-15 season. Walkom liked what he saw and decided to attend the academy in Connecticut. After a successful year at the academy on a highly-ranked team, he moved on to the NAHL with the Amarillo Bulls, where he was coached by former RMU and current Niagara Assistant Coach Matt Nicholson. He was joined by Cooley and another current Purple Eagle and Pittsburgh area product, Luke Edgerton, giving him some friends on the team. He had a very successful year, scoring 20 goals and then got drafted by the Madison Capitols of the USHL. He made the team out of camp and got to spend his last year of juniors in the United States Hockey League. 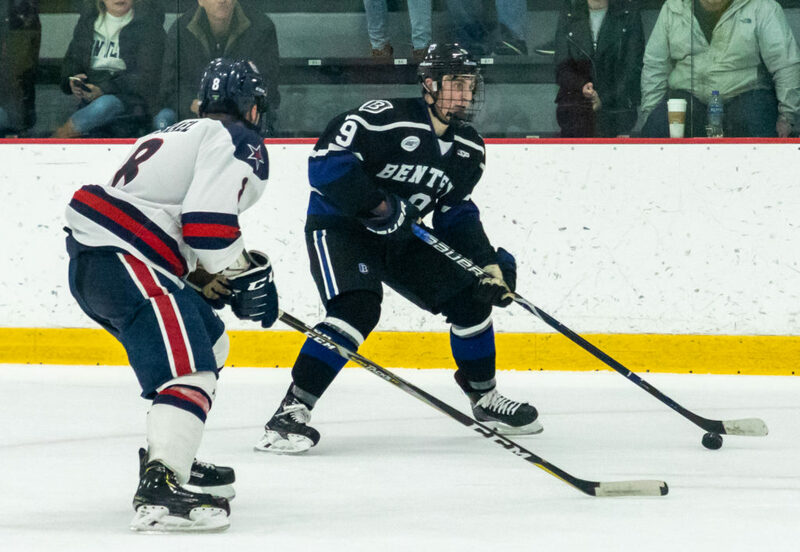 Walkom, a talented and gritty player battles along the boards at the Island Sports Center – ©Todhunter, Jared D.
Walkom’s prior experience has introduced him to many other players currently playing D-1 hockey and especially players in Atlantic Hockey, Bentley’s conference. This has given these match-ups an extra element of intrigue whenever he faces off against a former teammate or friend. “It’s really cool to see those guys and familiar faces,” he remarked. “It’s one of the coolest things ever, you go through the handshakes after the game and then kind of reconnect. It’s one of the best experiences. For any hockey player, the teammates he or she plays with can have a significant impact on the success he or she has. It is clear that Walkom has had the benefit of some great teammates over the years and still does at Bentley. However, hockey is also a very generational game. There are numerous stories of successful “hockey families” with successful hockey-playing parents raising successful hockey-playing children. For Brendan Walkom, it’s slightly different. His dad Stephen, a veteran of over 600 NHL games, has shared a lot of advice with him, which is expected. This advice has been focused on what it takes to compete at the NHL level, something unique that his dad has been able to experience first-hand in his officiating roles with the NHL. Brendan has admittedly grown to be more independent and responsible on his own as he’s gotten older, but still appreciates the pointers his dad gives after a game that he watches. For the most part, however, Stephen enjoys watching the games as a fan. In terms of his father’s job, the thought of following in his father’s footsteps as an official has never crossed his mind. His dad has pushed for him to be a player, and he has had success as one to this point. That being said, Walkom has also been able to enjoy certain aspects of his dad’s job both when he was younger and today. As a younger kid, when his dad was still an active official, attending Penguins games in which his dad was officiating was a major highlight. As the years have gone by, and Stephen has transitioned to directing the officials, he’s had to keep up to date with the games and observe the officials. Brendan has enjoyed watching many of these games with his dad and observing various aspects of the NHL with him. As he was growing up, Pavel Datsyuk was a player Walkom really admired. His ability to make plays with the puck that were seemingly impossible was always impressive. Today, Brad Marchand is a guy that stands out to him and someone he likes to model his game after. With a combination of skills and toughness, he is a difficult guy to play against which is something Walkom likes to be on the ice. An interesting aspect of being so closely connected to a referee, is the fact that referees are generally not liked by most people at a hockey game. Players, coaches and fans all share their distaste for a missed call or a bad call at various points throughout the game. Walkom definitely has a unique perspective getting to know the viewpoint of a referee, and can appreciate the difficulty of the job, however, that doesn’t give them a free pass by any means. After his upbringing in Pittsburgh, Walkom has made stops in Connecticut, Texas and Wisconsin to continue his development over various levels of hockey. These all prepared him for where he lives now and for the foreseeable future, Massachusetts, on the campus of Bentley University. The decision to commit to Bentley, which he made about a year ago was one that was not made lightly. He had a lot to consider, but in the end the strong business program and brand new arena were significant factors in deciding to go. After some initial, expected growing pains as a freshman: getting used to going to classes again and the demands of Division 1 hockey, Walkom has really settled in nicely. Walkom celebrates one of his two goals against RMU – ©Todhunter, Jared D.
The first two wins in the team’s impressive streak came a few weekends ago, when the Falcons visited the Robert Morris Colonials on Neville Island. They put up consecutive strong performances, winning 5-2 and 5-1 on a Friday and Saturday, respectively. The series also served as a homecoming for Walkom, playing in a competitive game in Pittsburgh for the first time in over three years. His coach gave him his first opportunity to soak it in by naming him as part of the starting lineup on Friday night. This allowed him and the many fans there on his behalf to hear his name called as he skated out to the blue line before the National Anthem. The experience was one that really meant a lot to him. Not only was the game close enough to home for family watch, it was also significant to him given his familiarity with the rink. He played there often during his youth years as events at the Airport rink began slowing down. He also still skates there regularly during the summers when he is back in Pittsburgh. In fact, he spent a few summers skating with RMU alumnus Brady Ferguson at the Island Sports Center in recent years. These games allowed him to come full circle, returning to a place where he trained and worked to help him reach the level of hockey where he is today. He also got to play in front of friends and family who supported him along the way, including his dad who definitely helped instill the work ethic and attitude needed to succeed. Brendan made the most of this opportunity, scoring twice in the team’s victory on Saturday, which has since propelled him into the greater role on the team that he mentioned earlier. That performance was the icing on the cake for a very memorable weekend.